Further plans to redevelop Nottingham’s Sneinton Market have now been revealed by Leonard Design Architects. Architects from the award-winning practice, which is headquartered in Nottingham but has a global reach, were brought on board by Carlton Street Trading as part of the wider regeneration of the area to provide design concepts that is in keeping with the heritage of the buildings. The initial plans, which are subject to approval by Nottingham City Council, show an exciting retail space, improved stalls for street food, and structures for pop-up shops. The redevelopment focuses specifically on three individual buildings adjacent to Sneinton Market which were not part of the 2014 refurbishment of the area. 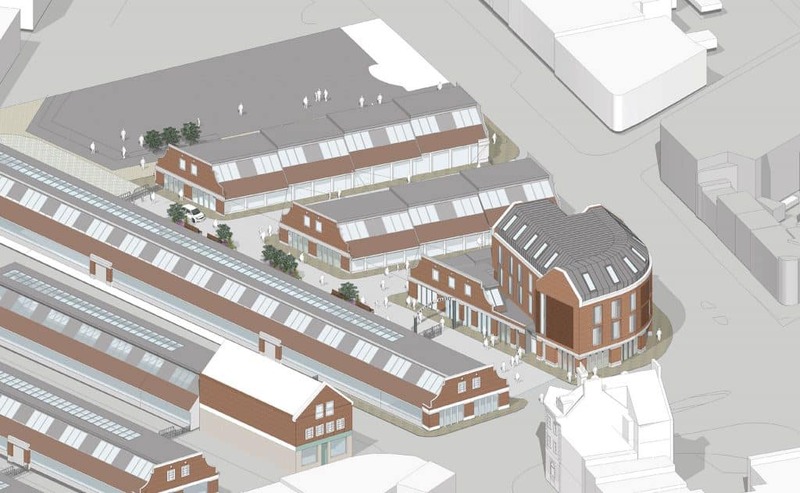 A main feature of the scheme includes using the curved façade of Southwell Road to further develop the prominent three-storey building adjacent to the market. Improved signage to the entrance of Sneinton Market will also be introduced to emulate iconic markets that have thrived in other key towns and cities across the UK, for example Borough Market in London. The overall offering is much more dynamic, aiming to attract more local businesses into the Creative Quarter and to provide places for the public to shop, eat and relax. “As part of the wider redevelopment of Sneinton Market, our design concepts were inspired by a project we recently worked on in Copenhagen to bring the city’s heritage buildings to life. As one of Europe’s leading creative spaces, we’re bringing some Copenhagen thinking into Nottingham. The Creative Quarter was established as a company in 2013 to lead the development of Nottingham’s Creative Quarter area which is made up by Sneinton Market, Hockley, the historic Lace Market, Pennyfoot Street and also includes BioCity, the UK’s largest bioscience incubation centre. The redevelopment of Sneinton Market forms part of a broader programme of regeneration activity to Build a Better Nottingham, which also includes work to improve the public realm in the Creative Quarter, more than £750m worth of investment in transport infrastructure across Nottingham, and the biggest council home building programme in the city for 40 years with more than 400 new council homes being built across the city.